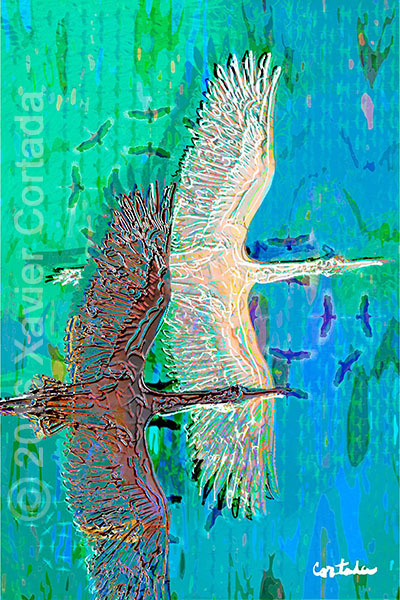 Xavier Cortada, “(Florida is…) Wood storks,” archival ink on aluminum, 60″ x 40”, 2016. The Wood Stork (Mycteria americana) is one of Florida’s signature wading birds, a long-legged, awkward-looking bird on land that soars like a raptor in the air. The generally accepted explanation for the decline of the wood stork is the reduction in food base necessary to support breeding colonies. This reduction is attributed to loss of wetland habitat as well as to changes in water hydroperiods from draining wetlands and changing water regimes by constructing levees, canals, and floodgates to alter water flow in south Florida.